The schematic of A64-OLinuXino is uploaded on GitHub together with A64 datasheet and user manual. So we are looking for feedback! It took us more time than expected, caused a bit by the switch to KiCAD. And what about to make a 96board compatible version? And while I hope that you’re able to develop one aweSOM standard I also hope that thermal issues won’t be a showstopper. The last 2 SoCs I played with (H3 and Actions Semi’s S500) suffer from thermal issues. They would require large heatsinks or even a fan to operate reliably under load. I hope the A64 performs better in this area. At least on mainline kernel you can deal with thermal stuff by changing CPU working points in DTS file. E.g. you can set up lower freq as maximum available, and then, obviously, worst case power consumption and thermal problems are getting reduced. It not going to work with vendor SDKs from pre-DTS age, but even on these it could work to echo max freq to sysfs file related to CPU frequency scaling. Either way, CPU would be limited in max freq and power consumption and heat goes down. And if you need minimal power consumption of idle system, pay attention to lowest work point (freq & voltage) used. Maybe, this layout helps to have compatible case and peripherals. Not all the solutions can have the power of Raspberry to push his own standard, like the 40pin GPIO. Are there more information regarding your new aweSOM standard? We’re currently developing a carrier board and want to avoid missing a future proof solution. On the schematics pdf there is a title in huge blue letters “Gigabit Ethernet or LCD”. Does that mean that only one of them can be used at a time? What approx. price tag will it have (low quantities)? This obviously misses some class of devices I call “automation controllers”, where you may want both LCD to show what’s going on and display controls and Ethernet to communicate. Though it could be dealt with by other means, if really necessary. As for configurations… on mainline kernel this can be probably addressed by different DTB files coming out of boot loader, so kernel knows what hardware it has got by “fake-PnP” way. But I guess A83 support is in its infancy so far. Whatever, it seems it going to be enjoyable device for many occasions. And opensource approach… yeah, finally someone got it right. Hopefully it would come with right price as well. And that’s where I may or may not want to pay for various bluetooth, wi-fi and other stuff. Have you looked at the Novena? I believe it has an OSS graphics driver too. I point at this as bunny has been very open about what it took to make this open arm laptop. From conception to delivery. @LinuxUser: The cpufreq stuff works also with older sunxi/Allwinner kernels. But where’s the point choosing a rather performant SoC based on A-53 and then let it run with half the clock speed? I recently did a review for a new S500 based board and compared integer/memory performance and temperatures of this quad-core SoC @ 1.1 GHz with a RPi 2 (BCM2836 @ 1.0 GHz), ODROID-C1+ (Amlogic S805 @ 1.7 GHz) and Wandboard Quad (i.MX6 @ 1.0 GHz). They performed somewhat similarly but the differences in temperature were huge: The S500 gets twice that hot as the i.MX6 while doing the same things. And regarding the aforementioned H3 and S500 it seems impossible to use their potential performance since they either shut CPU cores down when overheating or throttle down to cpu_freq_min. 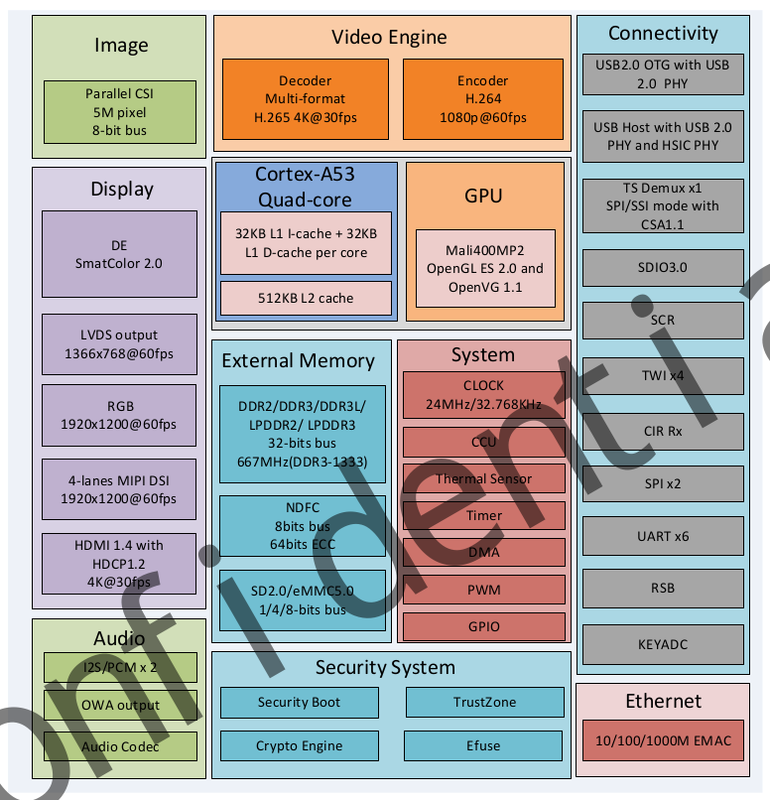 In terms of features I still hope that Olimex’ announcement of a quad core A20 successor will be true. But I expect an A-53 design to be twice as fast as an older A-7 design. Maybe wrong. @Thomas: right question. Tablets could go for fairly decent heatsinks attached at back cover, using something like elastic ceramic thermal interface to dissipate noteworthy amounts of heat at back cover, etc. Though it depends on device, ofc. So, either you have to provide decent heatsink, or… you see, to operate on higher clocks, one also have to raise the voltage. And since CMOS power consumption mostly composed of recharging capacitors, power consumption is expressed like F * C * Vcc^2, where F is frequency, C is capacity recharged, basically some constant, Vcc is CPU core voltage and Vcc is also proportional to F to maintain system stability. This means performance and consumption do not have linera dependence. I.e. reasonably low increase in frequency increases heat a lot, due to more frequent recharges and then it getting even worse due to need to increase core voltage to retain stability at this speed. I guess as the result, power consumed by system is betweeen O(F^2) and O(F^3). But you see, AW got one killer feature: AWs are dirt-cheap, while not being worst of the worst in terms of performance or peripherals. And, uhm, last time I’ve seen iMX stuff, they were horribly overengineered (just getting idea how to compose boot media structure can make you really insane) and awfully priced. Then, iMX had some really weird bus shortcomings, so their “gigabit” had hard time going beyond 400Mbit or so, due to internal bus saturation. Not sure, maybe they fixed it in later ICs, etc. I’ve been not in mood to learn it because I do not need overengineered overpriced ICs and boards. Realistically speaking, price matters. For me, a deal breaking point is like 50-60$. Put $100+ price tag, and it would be niche toy for few geeks who wants something strange. At $50 I could find plenty uses for automation and custom smart devices. At <$30 it going to almost take over whole the planet, like Pi did, even if hardware is a real crap. Just look on first Pi's with bunch of LDOs (really lame!!!) for CPU, generating awful heat, crappy and hot usb hub IC with weird and slow ethernet. It has been a really crappy engineering. But it had a noteworthy price. And while many people wanted it to be far more powerful… they would not pay three times more money to get there. I guess i.MX and few other high-end boards gone off the track due to crappy pricing policies. Btw, one thing… wi-fi module seems to be cheap chinese module for tablets. Sure, maybe it works in some android with vendor’s SDK. But does it supported by mainline drivers, etc? Realtek @ SDIO sounds rather uncommon, etc? Also, Realtek’s drivers aren’t exactly best of the best in Linux, they do not even use mac80211 framework in “official” drivers, so homegrown drivers are reinventing the wheel and come with loads of bugs and stability issues. It also got low TX power, which could kill speeds a lot, and its just 1T1R. While it is not a big deal for tablets, which do not transfer too much data anyway, more PC-like applications could want more decent and less troublesome connectivity, etc. Speaking for myself, I’ll be really not in mood to pay any extra bucks for such module. Though there is catch: I can’t readily offer better replacement which would be cheap, small and come in micro-module form factor. Definitely an interesting project. A53’s may be “old,” but are good enough for 90% of what modern laptops actually get used for – listening to music, running word processors, watching movies, and browsing the internet. I’d probably get more use out of a SOM formatted critter than anything else. Just wish that the ARM Cortex-A series had the same cross-connect capability as the XMOS series microcontrollers do. It’s literally a “need more cores, drop another package here” scheme. A single board running heterogenous processing with 16 A7’s and a 8 A53’s would be fun to play with. I’m almost hoping that there *IS* a problem with drivers for the integrated wifi as cautioned by LinuxUser above. Then the board would be designed without wifi (nor BT) and it would be cheaper and so would sell in greater numbers. Price is everything. Just a few euros makes a huge difference to public perception and sales volumes. It’s highly non-linear, and it’s easy to push a board into the “irrelevant” category through just a small rise in price. I’m not saying it’ll happen, but just pointing out that the danger does exist, and that cheaper boards will sell in far larger volumes. Olimex design the hardware, so if there IS a problem with the drivers, it will be caught very late in the pipeline (you should take into account that there will be no normal Linux distro soon, as Sunxi guys haven’t yet had the chance to work on real hardware). So this really is a VERY BAD wish from you that may only bring expensive AND not properly working hardware at the same time. Maybe it is possible to add one or two GPIO-connectors if NAND and/or BT/Wireless is not populated? Another thing i just saw on the schematics: Didnt you plan to use the 1.27mm-headers instead of the larger 2.54mm? On the schmatics you used GBH-254-SMT-40 headers for GPIO and LCD but GPH127SMT for emmc? Coin cell battery for the RTC? Also does the Li-ion battery connector has charging and step-up/down converters? On the schematic the RTL8723BS is powered with VBAT-EXT but the datasheet states a maximum 3.6V for the VDD3.3V. It looks like a fully charged battery could be over the 3.6V, no ? Another note is the HSIC not used, why no put it on a connector and propose an extension board with a USB hub ?